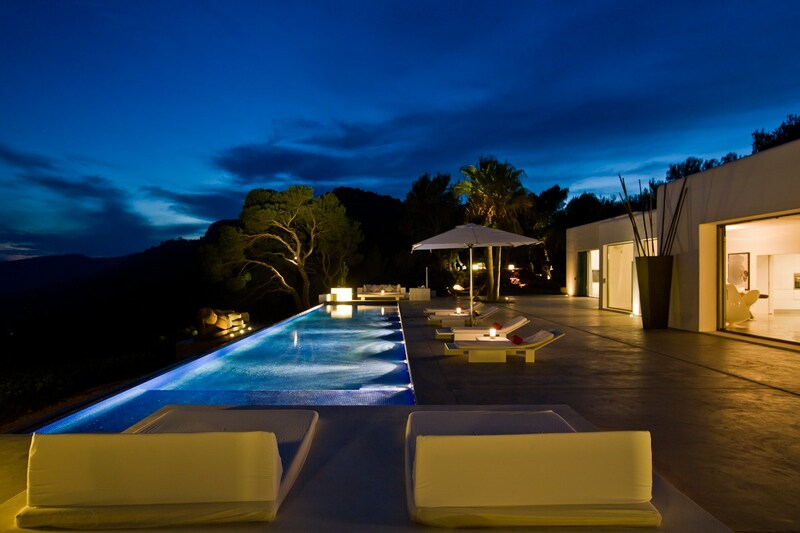 The Palms is an extraordinary luxury designer property, Ibiza luxury at its very best. 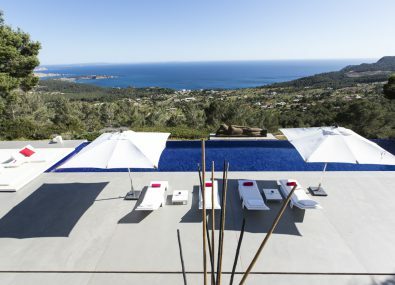 Located on top of a hill in Es Cubells, one of Ibiza’s most exclusive areas. 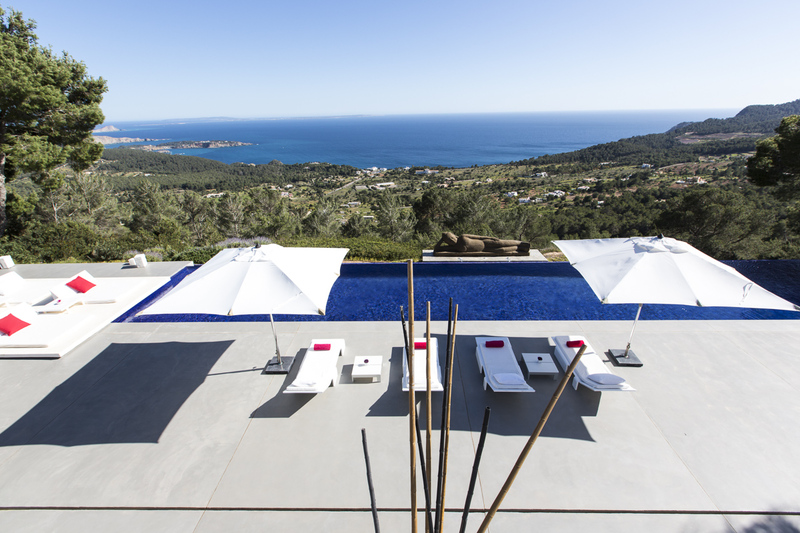 The elevation offers some of Ibiza’s most spectacular sea views. 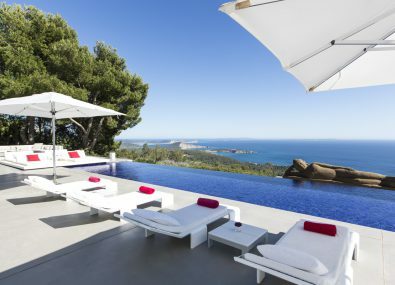 This contemporary Ibiza luxury villa offers high end design, exclusivity and privacy. 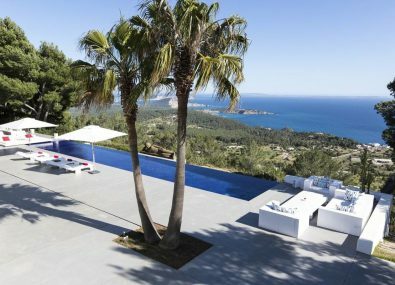 Set in a fantastic location, close to Ibiza’s hip Cala Jondal beach and also convenient for Ibiza Town. 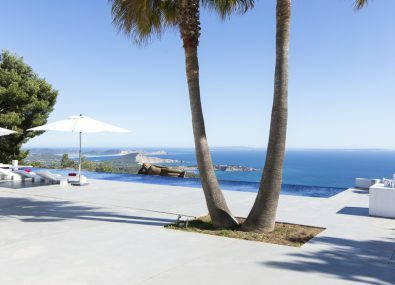 The beauty of this stylish Ibiza luxury property is undeniable, with sweeping views to Formentera, Ibiza old town and the southern coastline. 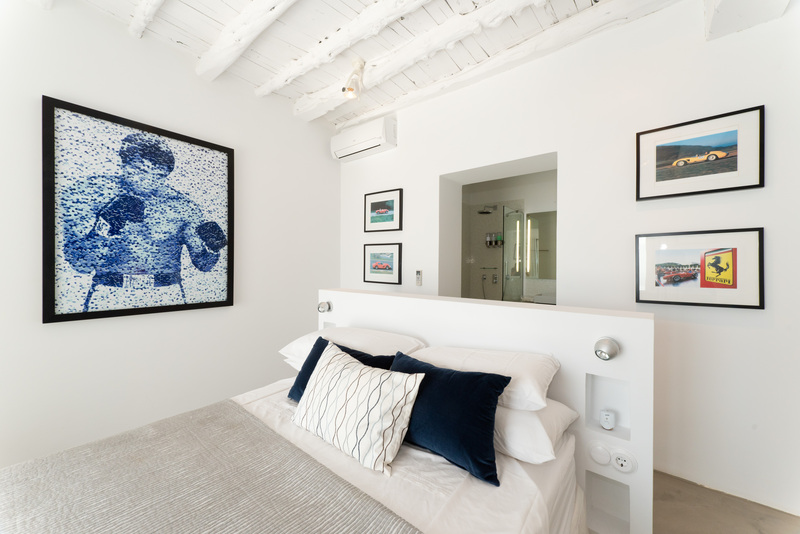 Recently refurbished and upgraded to offer five bedroom suites in the main house, two smaller suites being located on a lower level. Surrounded by beautiful exotic and lawned gardens. 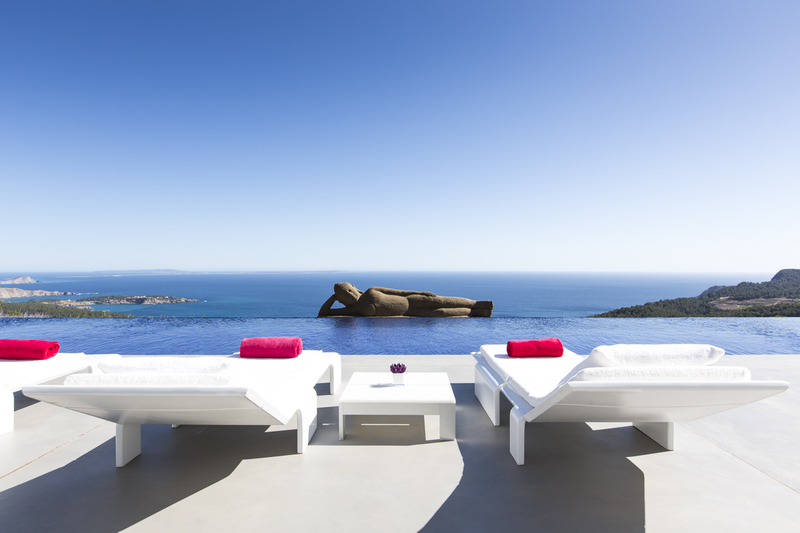 The many chill-out and dining spaces are perfect for guest entertainment. 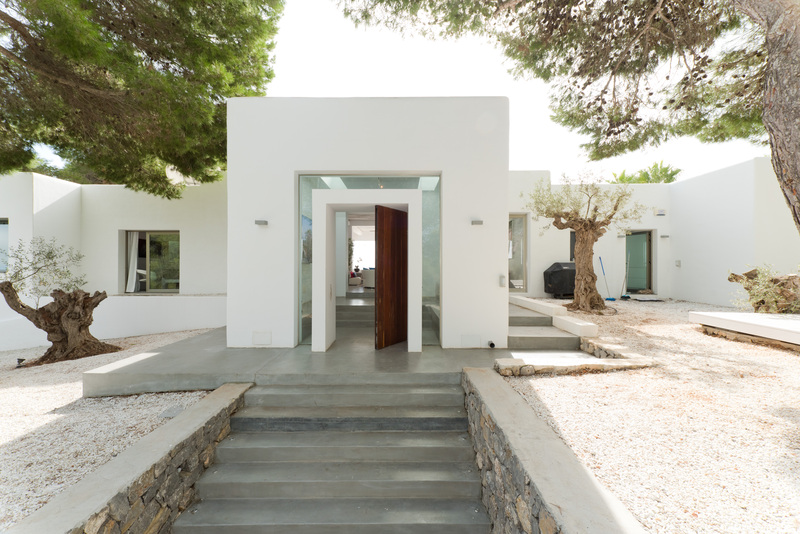 Amazing architecture runs throughout the villa with sleek minimalistic design. 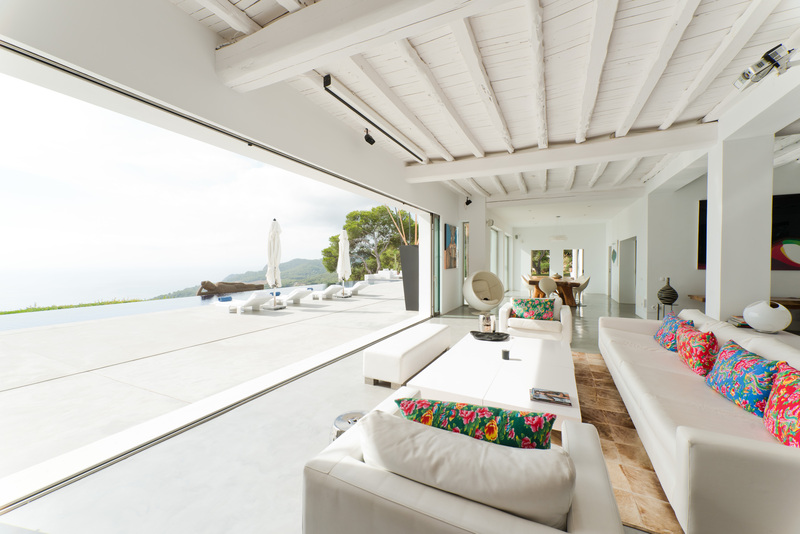 While sliding doors transform the villa by merging it seamlessly with the outside. 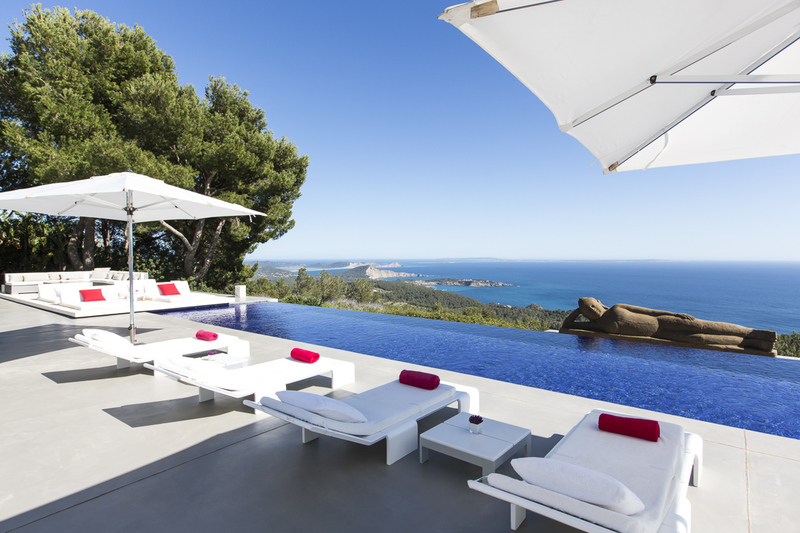 The villa’s design always providing breathtaking views to the sea and Formentera. 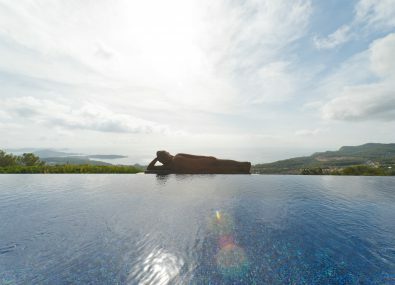 A unique feature is the professional gym, you can work out while enjoying the most incredible views! 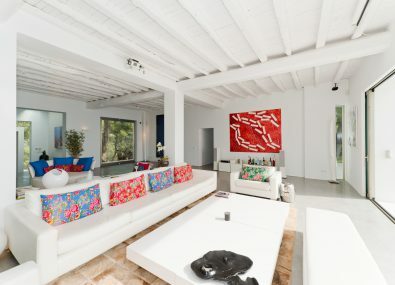 The Palms is the ultimate Ibiza luxury designer vacation home, with modern furnishings and exquisite details. 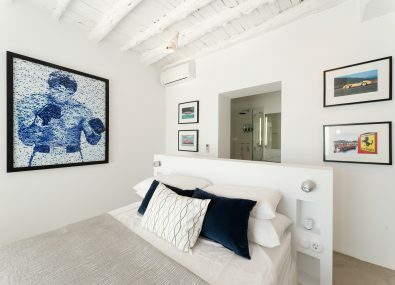 You can enjoy seven comfortable bedroom suites with en-suite bathrooms, walk-in wardrobes, flat screen TVs throughout, large chill-out lounges and two live in villa staff. 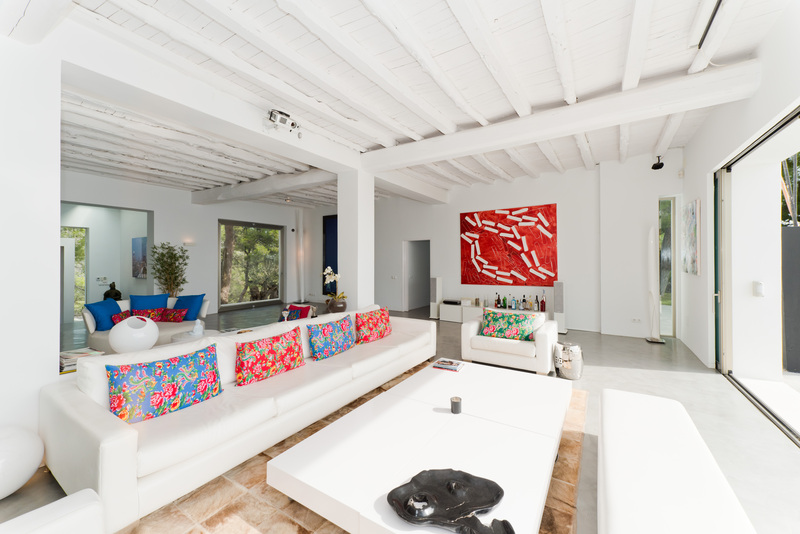 Spacious, stylish and comfortable, the open plan living space has several lounge seating areas. 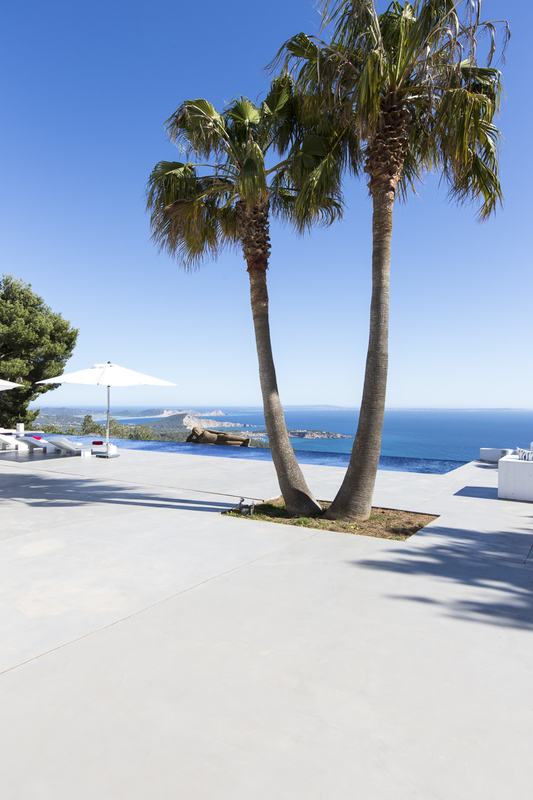 Doors slide open the full width of the area to optimize the incredible sea views. 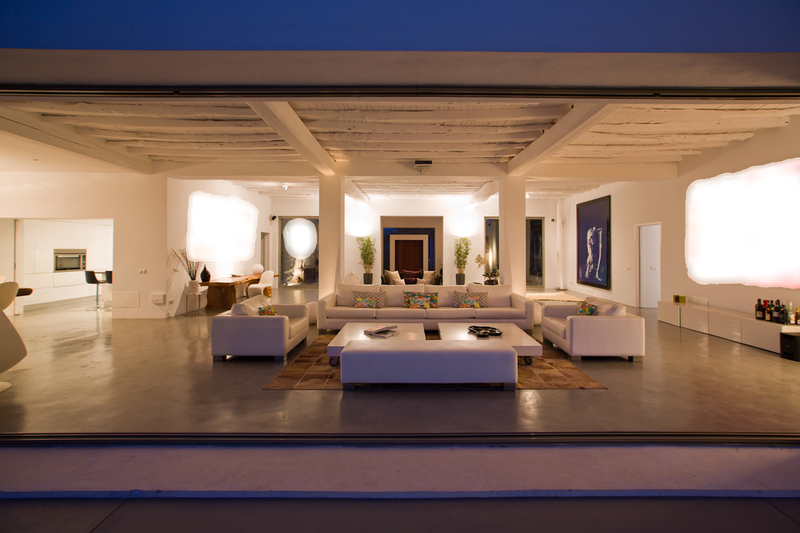 The open plan dining area has seating for 12, also featuring sliding doors to take in spectacular views. The stunning white modern fitted kitchen has a large central island. 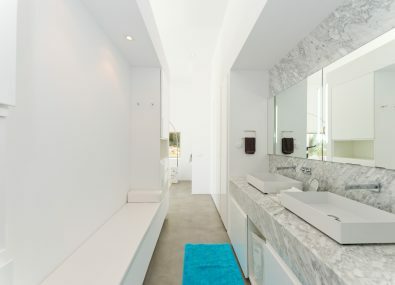 Master bedroom with king sized bed and en-suite bathroom with shower and also a free standing bath, dressing area and doors opening onto a terrace. 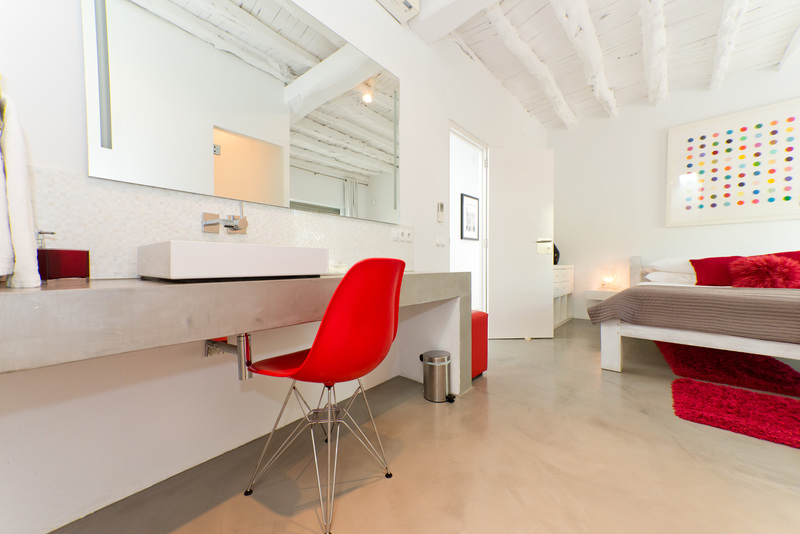 Opening from the hallway is a double bedroom with open plan bathroom with shower. 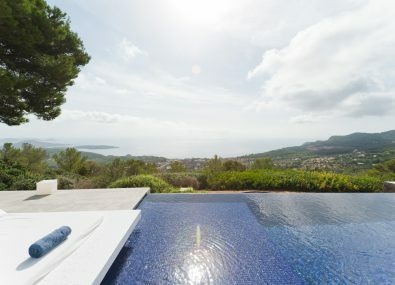 Overlooking the back of the villa is a double bedroom with open plan bathroom with shower. 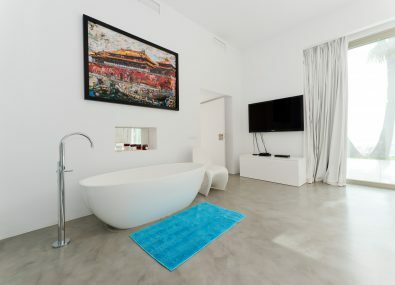 Double bedroom with en-suite bathroom with bath and shower, doors open out onto the pool terrace. 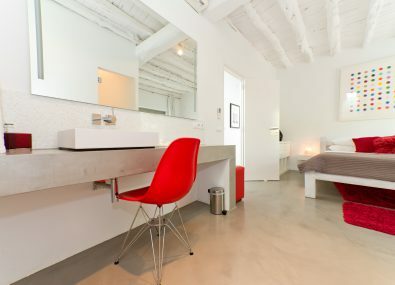 Double bedroom with en-suite shower room, doors open onto a covered terrace with a chill-out area. 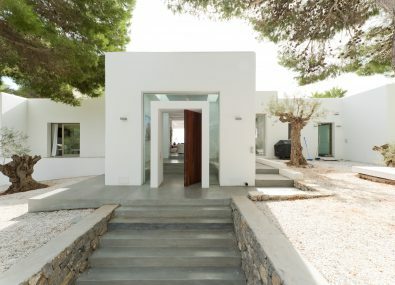 Located in the lower back garden are two additional bedrooms – both have double beds together with en-suite shower rooms. 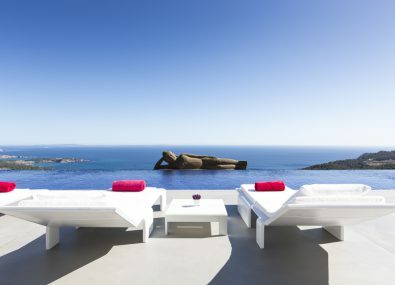 Absolutely stunning is the huge infinity swimming pool measuring 25m by 4m. 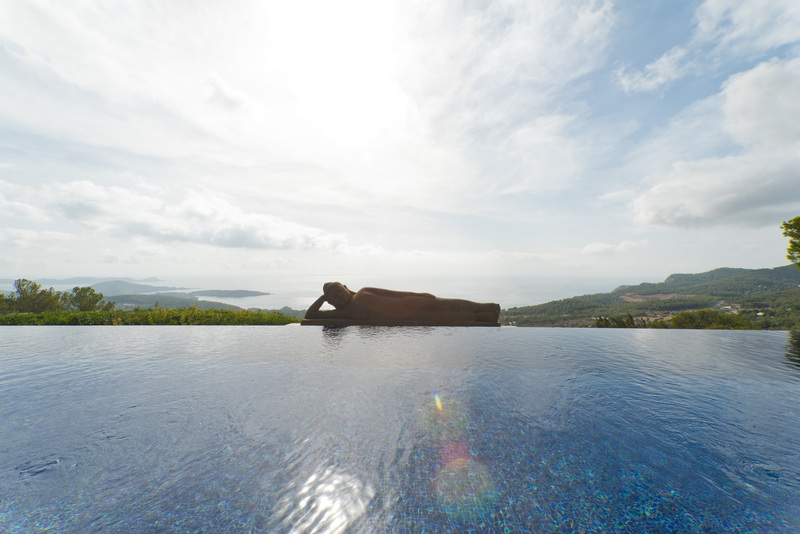 A real feature being the reclining Buddha which set against a breathtaking back drop. 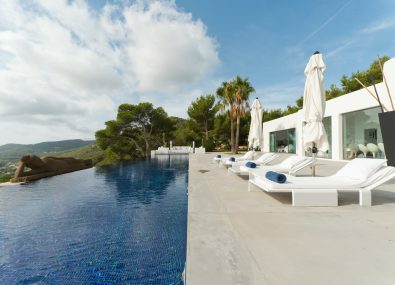 Expansive areas of manicured lawn surround the sleek white sun terraces, which are furnished with comfortable day beds, sun loungers and umbrellas. 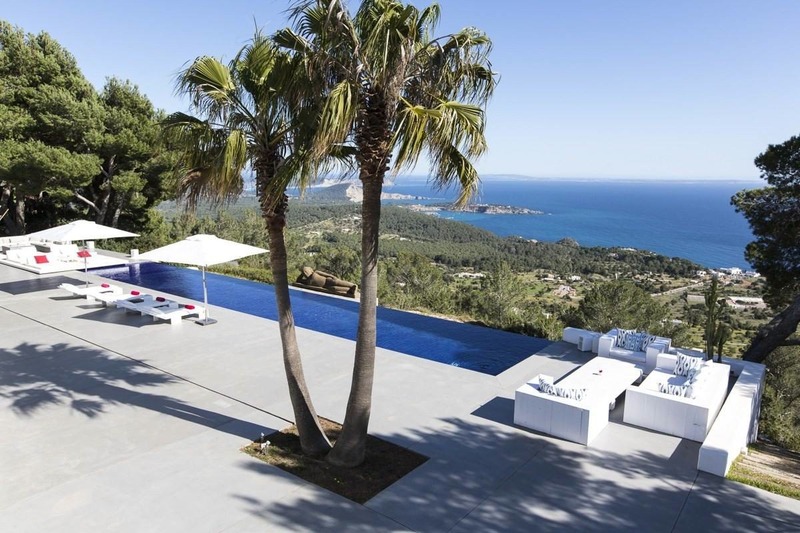 This incredible Ibiza luxury villa has various lounging areas for chilling out and also alfresco dining areas. Also located within the beautifully maintained gardens is an over sized chess board!